Steel Garage Doors - Garage Doors Torrance | G&G Garage Door Co.
Raised Panel Garage Door Alternative! Attractive unique steel garage doors offering design alternatives to classic raised panel and carriage house styles. Deep embossed panels with natural wood grain texture create authentic carriage house garage door designs. Available in long and short panels. At G&G Garage door we are committed to providing our customers with an exceptional quality steel garage door. 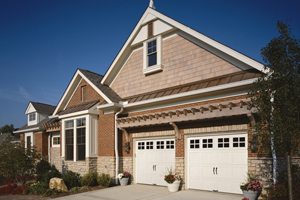 Please contact us today and see how much a new stained garage door can enhance your curb appeal!